Ilf and Petrov's American Road Trip: The 1935 Travelogue of Two Soviet Writers. Driving across America by Ford in 1935 from New York City to San Francisco and then back again gave two Soviet journalists an opportunity to discover our homeland at an important time in its colorful history. Fortunately one of them carried a 35 mm Leica camera and took hundreds of photos along the way. Now after languishing in various crumby USSR and then Russian archives, many of those images have been found and published in America after 70 years of neglect or abuse in Moscow. These unique pictures along with the diaries the two men kept of that historic trip have been joined into an entertaining little book, newly titled, Ilf & Petrov's American Road Trip; The 1935 Travelogue of Two Soviet Writers. So why am I sharing this with TE readers? You might well wonder so here it goes. The title caught my eye during a weekly trip to Austin Public Library and it hooked me immediately with its humorously insightful, if somewhat dated, commentary and a bunch of wonderful photographs; some are decidely reminiscent of our own WPA images of Depression era America. Early in the modest volume is an intriguing scene shot somewhere along a North Texas border highway with the following textual note. “Once, right before evening, having driven across the state of Oklahoma all day, we noticed a monument with rather strange architecture, something like a little grain elevator, off to the right of the road. 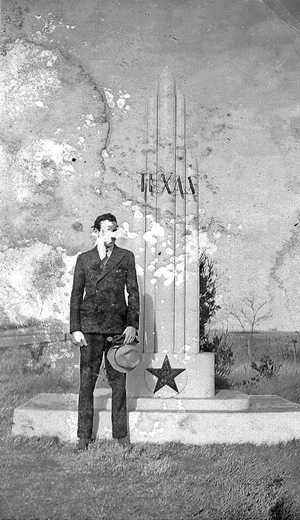 It was the boundary marker for the state of Texas. As we learned later, Texans love to decorate the borders of their state. On the monument’s pedestal, there was a five-pointed star: the emblem of Texas, the biggest and most romantic state in America.” As a bona fide history nut, I was really hooked now. The curious “monument” was decidedly picturesque so I fired off a query to Anne Cook, my longtime pal at the TxDoT Library here in Austin. She immediately responded with a page full of TE exchanges from last fall under the title Texas Panhandle Mystery Monument. With those fascinating entries under my belt, I resumed my travels with Ilf and Petrov and have been rewarded more than I not only expected but could nearly wish for and I read a lot. This book was perhaps providentially intended to be sought out by many of TE’s faithful so I’ll keep my remarks brief. With chapter headings like The Road, Small Towns, The Desert, Indians, Hollywood, Advertising, Negroes and New York, the two “Russian satirical writers” were tasked by Pravda to portray America and Americans to its Soviet readers. Pravda(the Truth) was the USSR’s leading(official) newspaper from 1912 until 1991 and so was read by millions daily. And while Ilf and Petrov kept it light for the most part, they also took several swipes at a mid 20th century USA that was far from the mostly quaint and charming place that Hollywood presented weekly to the world. Their two month sojourn was smack in the middle of America’s version of the Great Depression. This nation was, in their eyes, a country utterly different from their own and, in some ways, more than a little unrecognizable to us now, 70 years later. You will also discover an America strikingly familiar to the present generation as the long gone authors describe a Hollywood totally out of touch with daily life with the excesses of commercial advertising made modern only by its ever more immediate technology. This very readable artifact will make you laugh often and, nearly as often, will remind you that we’re still wrestling with crass materialism, racism, and several other sadly familiar conundrums that may simply be part of the human condition as lived within our borders at this moment, much as it was in 1935. The words, thoughts and images presented by the two Soviet men were never intended for the American public which gives them a freshness that was delightful to find. The book ends with a compelling account of how it was brought to us in spite of the ravages of time, warfare, neglect, and carelessness. Many of Ilf Petrov’s photographs were lost to oblivion but enough survived to make this volume dearly special. Alas, the book’s thirty-something authors were not so lucky as both perished within eight years of their memorable trip across our motherland. This bittersweet epilogue lends a preciousness to the material that cannot be measured but can certainly be appreciated and deserves to be, more than I can say.